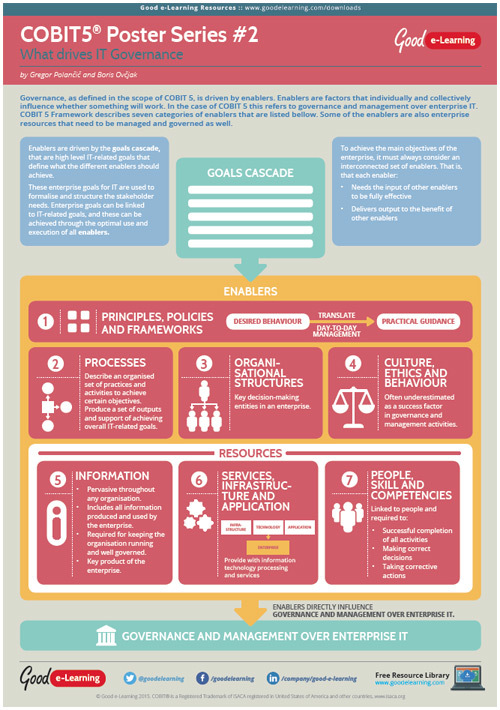 Learning COBIT 5 Poster 2 - What drives IT Governance? In order to achieve efficient and effective governance and management of IT the organization needs to have as much information available – it has to have a complete view of the organization. For this purpose COBIT 5 provides the help in the form of. Enablers include all resources that are relevant to governance and management of enterprise IT and are applicable across the organization. This posters presents COBIT 5 enablers and how they fit into the scope of the organization.